I’ve started this post a thousand times, and I just can’t seem to find the right words to begin. So maybe I should start at the beginning. In some ways your pregnancy was the easiest, in other ways it challenged me in different ways I hadn’t experienced before. Unlike with Lydia and William I didn’t suffer from horrendous morning sickness, there were no trips to the doctors, no time off work and no threat of hospitalisation. We sailed through the first trimester, tired, nauseous, but manageable. We booked in at the midwife, went for our 12 week scan and announced your impending arrival to the world. We were excited. And then the threat of a low lying placenta cropped up. I was due to have a third c-section, something that millions of women have, but I was also very aware that with each one you have, the more risks there are. So when I found out the placenta was partially covering my scar, I freaked out just a little. Dr Google likes to tell you worst case scenario, and it wasn’t pretty. The sonographer didn’t seem worried, told me they normally move up and with all likelihood it would be out of the way at my next scan. It wasn’t. It was still laying low and I was booked in to see a consultant. He told me the risks, explained they would have to cut through the placenta when delivering the baby via c-section and would have blood on standby because I would likely haemorrhage. These aren’t words you want to hear when you have two children already at home that need you, but there wasn’t anything I could do and I was also Mummy to this new tiny baby too. I was booked in for a further scan with a top specialist and when I got a call to say this had been moved forward because my consultant wanted it done sooner rather than later, I freaked out again. But the scan was clear. The placenta had moved and we were good to go for a normal planned c-section delivery at 39 weeks. March 24th 2017. As is the way with a planned c-section I was up extremely early, to take my medication and pack the last few bits into my hospital bag. We were off to become a family of 5. I made sure everything was ready for the other two and said another emotional goodbye and we set off in the car. We parked at the hospital and I was nervous. But I’d done this before, it’d be ok. We got up to the labour ward and were taken into the recovery ward to await the surgery. I had to have my bloodwork done again as they’d misspelt my name on my pre-op bloods and so they hadn’t been processed. I felt frustrated as I knew this could delay the surgery and we still didn’t know where we were on the list. The midwife thought we’d probably be second as we’d have to wait for the bloods. The doctors and surgeons had their meeting at 8 to decide on the order for the day and we waited patiently to hear. I tried to relax as I figured I’d have a couple of hours to wait before going down. 8:15am, the midwife came into the room and asked if we were ready and told me we were going. Honestly, this was by far the best way, I didn’t have chance to be as nervous, we just had to get on with it, and always, the team in theatre were amazing. And with this being my third baby, I knew I wasn’t going to win any awards for being brave and I ‘fessed up to the anaesthetist that I was scared of the cannula (last time it took a few attempts and it was excruciatingly painful and then fell out in recovering and I got soaked, and I mean soaked in my own blood) so he numbed it first and I barely felt a thing. It all went very smoothly, and before I knew it Tim had joined me in theatre. I did have to have the medication to keep my blood pressure up again as I felt a bit funny on the table but once that was in, I felt fine. 9:20 Imogen came into the world. You didn’t seem to cry as instantaneously as the others had and my heart seemed to stop still for a moment until I heard you scream. I honestly felt like I’d won the lottery, I’d done it. Three children. You was here. You were placed on my chest and you were just the tiniest little dot, my smallest baby and just oh so gorgeous. I was sewn up and we were taken back into recovery to weigh you and dress you and have our obs done. 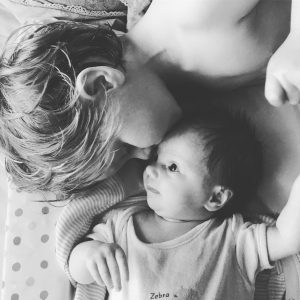 We didn’t have to stay in recovery too long and we were transferred to the post-natal Ward by early afternoon, allowing your brother and sister to come in and meet you after school that afternoon. Your big sister was so delighted to meet you, she gave me the proudest grins and held you in her arms. She’d put her posh cardigan on to meet you, obviously she knew what an important ocassion it was. William threw his giraffe toy on your face but he was so young, not even yet two. And that is where I shall leave the story. 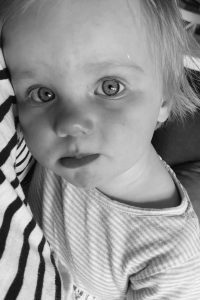 It’s a story I don’t re-live very often, it feels like a very long time ago as the events of that evening and our subsequent stay in neonatal have overshadowed it. But your birth was probably the most straightforward and relaxed of all three and I’d do it again in a heartbeat. And now today you’re one. How is that possible? You’re my last, the one I will probably forever baby, and yet here we are saying goodbye to the baby days. You crawl around after your siblings, you stand up and watch TV with them, you love to eat whatever they are eating, you say mama, dada, drink, duck, and you snort for Peppa Pig! You clap, you do ‘high five’, you climb on everything and you drink from a beaker. Your favourite comforter is a muslin blanket and you’ve only been having one nap a day for quite some time. And you’re boisterous. You know your mind and you do what it takes to get what you want. Sometimes that makes you difficult to parent but I actually applaud your spirit, I’m incredibly proud of the fact that you’re a fighter and I hope you take that attitude through with you into your future years: an attitude of resilience, that stands up for your rights and proactively seeks what you want to do in life. This next year I’m excited to see you take your first steps, to start interacting even more with your siblings and I’m excited to start doing things for YOU as William starts pre-school. Maybe you’ll love the zoo like your brother, or maybe you’ll favour the park like your sister, or something else entirely. 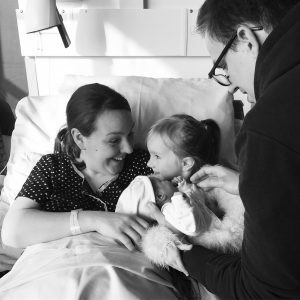 Imogen, you complete our family and have brought us unmeasurable amounts of joy and love, you have challenged us and made us stronger and brought us all closer together. So, on this, your first birthday, please know baby girl just how loved you are.